Nearly one in six people worldwide suffer from neglected tropical diseases (NTDs). This collection of diseases primarily impact the world’s poor, who commonly contract them through bites from insects or by ingesting or having contact with contaminated water or soil. More than a half billion children suffer from NTDs each year. IMA World Health has been working to address NTDs for more than 20 years in Asia, Africa and the Caribbean. Broadly, IMA projects primarily target five NTDs that cause the greatest morbidity and mortality: lymphatic filariasis (LF), onchocerciasis (known as River Blindness), trachoma, schistosomiasis and soil-transmitted helminths (STH). IMA also addresses visceral leishmaniasis, commonly known as kala-azar, in endemic areas within South Sudan. Controlling and eliminating NTDs is critical, as they impact the achievement of most health and development indicators. NTDs inhibit children from learning and developing to their full potential and prevent adults from working and supporting their families economically. NTDs also cause physical deformities along with disability, stigma, social isolation and shame. As a recognized leader in the control and elimination of NTDs, IMA uses a combination of evidenced-based strategies to map and scale-up NTD control in partnership with governments and civil society partners and with funding from the United States government and other donors. Most notably, IMA is a partner in Haiti, Tanzania and the Democratic Republic of Congo on the global ENVISION project, funded by the U.S. Agency for International Development and led by RTI International, to assist NTD control programs to eliminate and control NTDs. IMA contributed to the global goals of LF elimination by 2020 through a non-research cooperative agreement with the CDC. IMA’s activities included providing TAS trainings in Ghana and Uganda. It has worked closely with the CDC to lead efforts in contributing to the development of global guidelines for integrated LF TAS surveys through pilot LF TAS, STH and malaria surveys in Tanzania and Haiti. IMA has also worked with a nationwide non-government organization in India, Church’s Auxiliary for Social Action, to develop and implement community-led home-based care and treatment programs for patients suffering from lymphedema. IMA assists the Ministry of Health in 52 health zones to integrate NTDs within the overall basic health care package and to better plan and implement MDA in the ASSP project, funded by UK Aid’s Department for International Development (DFID). Through ASSP, IMA organized a Vitamin A supplementation campaign for children 6-59 months and de-worming with mebendazole of children 12-59 months in all of ASSP’s supported health zones. In total, 1,542,053 children received Vitamin A and 1,261,398 children received mebendazole during this campaign. Learn more. The ENVISION project, funded by USAID and led by RTI International, aims for the control and elimination of five neglected tropical diseases in the DRC: LF, onchocerciasis, schistosomiasis, STH and trachoma. As an implementing partner, IMA conducted annual MDA of three medications among more than 500,000 people in six zones in northern Maniema Province in 2015-2016 and in three zones in 2017, with the goal of treating 80 percent of the population for LF, onchocerciasis, schistosomiasis and STH. In keeping with USAID’s updated strategy for DRC, in 2018 IMA began conducting rapid assessments and mapping surveys to determine the extent of trachoma in suspected regions of the country. To date, mapping has been completed in Ituri and Bas Ulele provinces, and rapid assessments have been completed in Equateur, Mbandaka, Tshopo and Maindombe provinces to determine if mapping is needed. As the lead implementing partner for ENVISION in Haiti, IMA has worked alongside the Haiti Neglected Tropical Disease Control Program, a joint effort between the Ministry of Health and Population (MSPP), the Ministry of Education and other partners. With funding from USAID and leadership from RTI International, IMA helps the government to provide mass drug administration (MDA) through community posts and schools across Haiti’s 10 departments to treat LF and STH. IMA has trained approximately 34,000 community leaders, promoters and distributors to educate the population about LF and STH, persuade the highest number of households possible to participate in MDA and conduct MDA. In Haiti, IMA led the scale-up of nationwide treatment and treated nearly 6 million people annually for LF and STH. Following guidance from the World Health Organization (WHO), IMA and its partners also conduct transmission assessment surveys (TAS) in communes which have had at least five consecutive MDAs at high coverage and a prevalence of MF <1% or Ag <2% in sentinel and spot-check sites. Of the 140 communes in Haiti, 118 communes are now under surveillance with 22 communes still undergoing MDA. With funding by the Bill and Melinda Gates Foundation/University of Washington, Haiti was selected as one of five countries to participate in a high-profile clinical safety and efficacy trial and acceptability study. 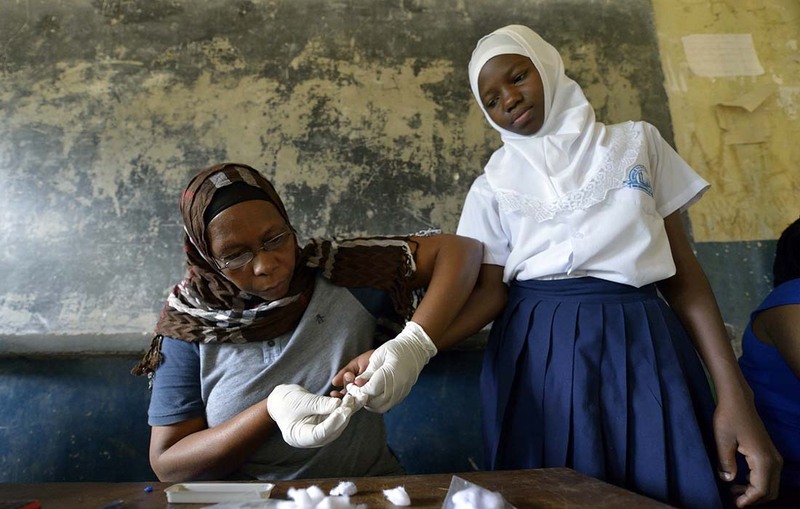 The study—which was led by the Haiti MSPP, U.S. Centers for Disease Control and Prevention (CDC), RTI and the University of Florida with IMA as the implementing partner—has been instrumental in facilitating progress toward the global LF elimination effort and shaping WHO’s LF treatment guidance. IMA worked with partners to provide emergency response for treatment of visceral leishmaniasis (kala-azar) in the former Jonglei and Upper Nile states. Kala-azar, which is transmitted by the sandfly, is almost always fatal if not treated. This program improves diagnosis and effective treatment, builds surveillance capacity and improves the ability to respond to outbreaks. To accomplish these goals, IMA has trained 318 health workers to date, supervises kala-azar treatment centers, establishes emergency response teams, provides pharmaceuticals and supplies and supports the Ministry of Health’s NTD departments and the National Reference Laboratory. With funding from USAID through RTI International, IMA collaborates with the Ministry of Health and Social Welfare to eliminate and control five NTDs endemic in Tanzania, including onchocerciasis (river blindness), lymphatic filariasis (LF), schistosomiasis, soil-transmitted helminths (STH) and trachoma. IMA currently coordinates mass drug administration (MDA) in 19 regions and 134 districts throughout Tanzania, training more than 11,414 front line health workers, 27,087 teachers and 90,284 community drug distributors to support treatment for over 20 million individuals annually. Supporting the World Health Organization’s global control and elimination goals, IMA with the Tanzania NTD Control Program has carried out MDA, disease specific assessments (DSAs) and other interventions in all NTD-endemic districts across mainland Tanzania. As of October 2018, Tanzania has been able to stop MDA for LF in 96 of the 120 endemic districts, which amounts to 21.4 million people—69 percent of those living in endemic areas—who are no longer at risk for LF. Additionally, as of June 2018, Tanzania has been able stop trachoma MDA in 59 of 71 endemic districts, which means 14.8 million people—86 percent of those who were living in endemic areas—are no longer at risk for trachoma. With support from DFID and leadership from Sightsavers, IMA provides trachoma sufferers with surgical services and other case management support to help relieve pain, enable them to return to work and prevent vision loss and blindness. IMA leads implementation in Mtwara region, building district surgical team capacity. IMA has reached 4,200 patients with sight-saving surgery to date. IMA helped to mitigate the devastating impact of LF through health care worker surgical training and direct surgery for patients suffering from fluid-filled hydroceles. With support of partners Presbyterian Church (USA) and Izumi Foundation, more than 1,300 people received life-changing surgeries, freeing them from daily pain and disability and improving their self-esteem from addressing what is often seen as a shameful condition.